Vlorë (Albanian pronunciation: [ˈvlɔːɾə]) is the third most populous city of Albania. It is the capital of the surrounding Vlorë County. Located on the southeastern Adriatic Sea, it is one of the country's southernmost dominant economic and cultural centers. Vlorë was founded as an Ancient Greek colony in the sixth century BC under the name of Aulon and has been continuously inhabited ever since. It became the seat of a bishopric. In modern times, the city served briefly as the capital of Albania. Notably Albanian Declaration of Independence was proclaimed here on November 28 in 1912. Culturally and economically it is one of the most significant cities of southwestern Albania. Vlorë is home to Albania's second largest port, the Port of Vlorë. 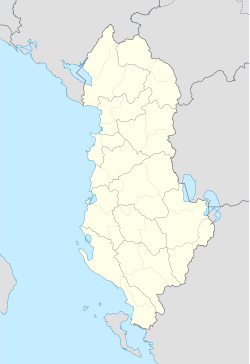 The modern name for the city in Albanian is Vlorë (indefinite Form) and Vlora (definite Form), pronounced as [ˈvlɔɾə] and [ˈvlɔra]. In Gheg Albanian it is known as Vlonë and Vlona, pronounced as [ˈvlɔnə] and [ˈvlɔna]. Vlorë was created in antiquity as a Greek colony in the territory of Illyria. Its first name was Aulón (Greek: Αυλών, also the name in modern Katharevousa), meaning "channel, glen" and possibly a translation of another indigenous name. The medieval and modern Greek name is Avlonas (Αυλώνας Aulōnas [avˈlonas], accusative Αυλώνα Aulōna [avˈlona]), and is the source of the Latin Aulona, Italian name Valona (also used in other languages) and of the obsolete English Avlona. During the Ottoman era the city of Vlorë was known in Turkish as Avlonya. Due to its strategic position on the Adriatic Sea, especially the Bay of Vlorë, which forms a natural harbor, Vlorë occupied a significant place in classical antiquity as a base for trade by many peoples. Vlorë is considered as one of the oldest cities in Albania and the region. The city was founded by the ancient Greeks in the 6th century BC and named Aulōn. It is also one of several colonies on the Illyrian coast,[a] mentioned for the first time by Ptolemy (Geographia III xii, 2). Other geographical documents, such as the Tabula Peutingeriana and Hierocles' Synecdemus, also mention it. The city served as an important port of the Roman Empire, when it was part of Epirus Nova. Aulon (Avlona) became an episcopal see in the 5th century. Among the known bishops are Nazarius in 458 and Soter in 553 (Daniele Farlati, Illyricum sacrum, VII, 397–401). The diocese at that time belonged to the papal Pentarchy. In 733, it was annexed with the eastern Illyricum, to the Patriarchate of Constantinople, and yet it is not mentioned in any Notitiae Episcopatuum of that Church. The bishopric had probably been suppressed for though the Bulgarians had been in possession of this country for some time, Avlona is not mentioned in the "Notitiae episcopatuum" of the Bulgarian Patriarchate of Achrida. Map of Simon Pinargenti Valona in 1573. Aulon, no longer being a residential bishopric, is today listed by the Catholic Church as a titular see, a suffragan bishop of Durrës, being distinguished from a Greek titular see called Aulon by the use for it of the adjective Aulonitanus, while the adjective regarding the Aulon in Euboea (Ionian Greece) is Aulonensis. The diocese was nominally restored as Latin titular bishopric Aulon, or Valona in Curiate Italian; from 1925 it was (als) named Aulona in Latin and/or Italian, since 1933 it's only Aulon in Latin, Aulona in Italian. It was a bishopric from the fifth century until the Bulgarian rule. The city played a significant role in the conflicts during the 11th and 12th centuries between the Latin Norman Kingdom of Sicily, which established a Latin bishopric, and the Byzantine Empire. After it was captured by the Ottoman Empire in 1417, it became a sanjak centre in Rumelia Eyalet as Avlonya; and after coming under Venetian possession in 1690, the city was restored to the Turks in 1691, becoming a kaza of the Sanjak of Avlona in the vilayet (province) of Janina. At the time the city had about 10,000 inhabitants; there was a Catholic parish, which belonged to the Archdiocese of Durrës. In the 16th century, it served as an important congregation center for Sephardi Jewish refugees from Spain and Portugal. During the early period of Ottoman rule, Vlorë became an international port centered on a high volume of trade between western Europe and the Ottoman state. In 1851 it suffered severely from an earthquake. On November 28, 1912, Ismail Qemali declared the Albanian National Awakening in Vlorë, during the First Balkan War. The city became Albania's first capital following its independence, but was invaded by Italy in 1914, during the World War I. The city remained occupied by Italian forces until a Albanian rebellion forced the Italians out of Albania in 1920. Italy invaded Vlorë again in 1939. The city remained under Italian occupation until Italy surrendered to the allies in 1943. Subsequently, Nazi Germany occupied the city until 1944. The city was liberated in 1944 by communist forces under Enver Hoxha. During the World War II, Sazan Island became the site of a German and Italian submarine base and naval installations; these installations were heavily bombed by the Allies. After World War II with Albania falling under the communist regime, the port was leased out to the Soviet Union for use as a submarine base. During 1960 and 1961 it served as a theater in the aftermath of the fall out between Albanian dictator Enver Hoxha and Nikita Khrushchev. Albania denounced the USSR as 'revisionist' and took Chinese side in the world communist movement split. In April 1961 the Soviet Union resenting being pushed out, after considerable investment in the naval facilities at nearby Pasha Liman Base threatened to occupy Vlora with Soviet troops, and cut off all Soviet economic, military and technical aid to Albania. The threat was not carried out, as a result of the simultaneous international developments, chief among them the Cuban missiles crisis. Hoxha realizing the vulnerability of Albania, after the USSR invaded Czechoslovakia in 1968, in a paranoia move ordered hundreds of thousands of concrete bunkers being built. They still litter the Albanian landscape. Under Hoxha, Vlorë served an important recruiting centre for the Sigurimi, the Albanian secret police. In 1997, Vlorë was the center of the Albanian civil war of 1997 after the collapse of several fraudulent investment schemes that led to the downfall of the Sali Berisha administration. Vlorë is located in southern Albania and the administrative center of the homonymous municipality seat of Vlorë County. It is situated on the Bay of Vlorë, an inlet on the Adriatic Sea, almost surrounded by the Ceraunian Mountains. The Port of Vlorë is closer in proximity than any other to the port of Bari, Apulia in southeastern Italy, and is just 70 nautical miles (130 km) from Salento's coasts. Sazan Island is nearby, strategically located at the entrance to the Bay of Vlorë. The town is surrounded by gardens and olive groves. Valonia oak (Quercus macrolepis), the mass name for acorn cups obtained in the neighboring oak forests and (because of its chemical derivatives) used by tanners, derives its name from Valona, the ancient name of Vlorë. A motorway is being constructed linking the city with Fier and Albania as a whole. One of the most panoramic routes of the Albanian Riviera starts to the south of town stretching up to Sarandë in southernmost Albania. The present municipality was formed by 2015 local government reform, which merged these former municipalities: Novoselë, Orikum, Qendër Vlorë, Shushicë and Vlorë; they became municipal units. The seat of the municipality is Vlorë. The total population is 104,827 (2011 census), in a total area of 616.85 square kilometres (238.17 square miles). The population of the former municipality at the 2011 census was 79,621. The new municipality extends from the Aoös river delta near Novoselë up to Llogara Pass including the town of Orikum. The population of the municipality is 104,827. During the 19th and early 20th century, Albanian speaking Muslims were the majority population of Vlorë while there was a small number of Greek-speaking families, Albanian Orthodox, Jews, and an even smaller number of Catholics. In 1994 the ethnic Greek community of the city numbered 8,000 people. A Greek school was operating in the city in 1741. View of a ship in the Port of Vlorë. The city of Vlorë remains a major seaport and commercial centre, with a significant fishing and industrial sector. The surrounding region produces petroleum, natural gas, bitumen and salt. The city is also the location of important installations of the Albanian Navy. It has grown in importance as an agricultural center with very large-scale planting of olive and fruit trees, and as a center of the food processing, oil and bitumen export industries. Historically, the surrounding district was mainly agricultural and pastoral, producing oats, maize, cotton, olive oil, cattle, sheep, skins, hides and butter. These commodities are exported. (120 kilometres (75 miles)) and the Port of Vlorë (5.7 metres (18.7 feet)), the two largest ports in Albania. The Land and Environmental Information is located in a flat, saline land, partially covered by Soda Forest. The area is suitable for industrial and environmentally friendly development. The Industrial development inside the zone eligible activities that can be developed in TEDA are: industrial, processing, commercial, goods storage, light industry, electronics, auto parts manufacturing and port related activities. The Labor market: Official data from 2014 set the employable labor force in Vlora at 125,954, of which 84,836 are currently employed. 35% of the labor force in Vlora has a high school degree, while 17% has a university degree. Vlora boasts the second largest university in Albania, Ismail Qemali and several vocational education schools. The Ministry of Transportation has made plans to begin the construction of Vlore International Airport. The project commenced in 2018 and it will be the third largest airport in Albania after Tirana International Airport and Kukes International Airport. The city is served by Vlorë Railway Station, though the rail service is now very limited. The Port of Vlorë is the second largest in the country. Vlorë comprises a dry cargo port, the Vlorë 1 petroleum port and a fishing harbour. The Port is conceived as part of the Lungomare Project, stretching from the harbor to the Forest of Sodë. Part of this project is the construction of a yacht port, while the new Trans-Balkan road, which has been completed, will be added a second segment that starts from the existing road to the port . The rehabilitation of the port, expected to end by the end of 2016, includes the construction of the area for freight, and a passenger terminal. Vlora will have for the first time a modern port for both freight and passengers, to become a catalyst of the economic and tourist development of Albania. In Vlorë there are three functioning museums: the Independence Museum, the Historic Museum and the Ethnographic Museum of Vlorë. Each museum discovers different characteristics of the Vloran history. Vlora host also the Shevqet Musaraj Library. Vlorë is home to different architectural styles that represent influential periods in its history. The architecture is influenced by Illyrian, Greek, Roman, Italian and Communist architecture. In the 21st century, Vlorë has turned into a modern city, with modern new buildings and many green spaces. The Lungomare Vlora Waterfront Project is currently under construction. Muradie Mosque was built in 1537 by the Ottoman Turkish architect Mimar Sinan during the rulership of Suleiman the Magnificent. New Hotels and Apartments built in Vlorë. Tourism has become a major industry in recent years, with many hotels, recreational centers, and vast beaches. The city has a good view over the Bay of Vlorë, which is considered the frontier between the Adriatic Sea and the Ionian Sea. The Island of Sazan is close-by, at the entrance to the bay. Italy is just 80 kilometres (50 miles) away. With 300 sunny days per year is a good location to stay for business or vacations. Some nearby beaches include Palasë, Dhermi, Vuno, Himara, Qeparo and Borsh. The bay offers good conditions for navigation at sea and anchorage of ships. Other attractions include food, wine, mountains and sports. There are three internationally known journals based in the University of Vlora. They are the highest quality journals of any Albanian speaking university. Albanian Journal of Mathematics, Albanian Journal of Mechanical Engineering There is also a scientific journal published quarterly in Albanian: Buletini Shkencor i Universitetit te Vlorës Since 2008 it gives home to the Academicus International Scientific Journal, a scientific publication in English language, peer-reviewed, founded by Arta Musaraj . Many summer schools and training sessions are organized at the University. Vlora is a tourist destination and this makes it very attractive for organizing international conferences. In addition, University of Vlora has programs in naval engineering and navigation. Studying the Bay of Vlora has been one of the main projects of the navigation department in the last few years. The Bay of Vlora is an important place in world history with important events such as Caesar's battles, medieval times, World War I, and World War II, etc. [vague] In the bay is one of the oldest military naval bases in the world which continues to be used to this day. The Naval Base of Pashaliman was the only Russian base in the Mediterranean in the 1950s, and was the hot spot of conflict between the Russians and the Albanians in 1961 when Albania pulled out of the Warsaw Treaty. The Department of Navigation is mapping all the ships sunk in the bay area, and is doing research in the area of marine archeology in the ancient town of Orikum (Oricum). Researchers from UV participate in congresses and conferences all over the world. UV has joint projects and exchange programs with some of the best universities in the world and very actively is trying to expand further such programs. ^ "town that is the second seaport of Albania. It was strategically important during the Roman period and in the 11th to the 12th-century wars between Normans and the Byzantine Empire" (EB editors 2016). ^ The New Encyclopædia Britannica. Encyclopædia Britannica. 1974. p. 479. ISBN 0-85229-290-2. ^ Room, Adrian (2006). Placenames of the World: Origins and Meanings of the Names for 6,600 Countries, Cities, Territories, Natural Features, and Historic Sites. McFarland, Incorporated. p. 398. ISBN 978-0-7864-2248-7. Baynes, T.S., ed. (1875–1889). "Avlona" . Encyclopædia Britannica (9th ed.). New York: Charles Scribner's Sons. " in the Encyclopædia Britannica, 9th ed. 1878. ^ Gawrych, G. W. (2006). The crescent and the eagle: Ottoman rule, Islam and the Albanians, 1874-1913. I.B.Tauris. p. 23. ISBN 978-1-84511-287-5. Google Book Search. Retrieved on August 25, 2009. ^ a b c Vailhé 1912. ^ Stanford J. Shaw; Ezel Kural Shaw (29 October 1976). History of the Ottoman Empire and Modern Turkey: Volume 1, Empire of the Gazis: The Rise and Decline of the Ottoman Empire 1280-1808. Cambridge University Press. p. 69. ISBN 978-0-521-29163-7. ^ "Vlorë Weather Averages". August 2011. Archived from the original on 2010-08-21. ^ Kokolakis, Mihalis (2003). Το ύστερο Γιαννιώτικο Πασαλίκι: χώρος, διοίκηση και πληθυσμός στην τουρκοκρατούμενη Ηπειρο (1820–1913) [The late Pashalik of Ioannina: Space, administration and population in Ottoman ruled Epirus (1820–1913). EIE-ΚΝΕ. p.52. "β. Ο διεσπαρμένος ελληνόφωνος πληθυσμός περιλάμβανε... και μικρό αριθμό οικογενειών στα αστικά κέντρα του Αργυροκάστρου και της Αυλώνας. [b. The scattered Greek-speaking population included ... and a small number of families in the cities of Gjirokastra and Vlora. ]"; p. 53. "και την ακόμη ολιγομελέστερη ομάδα των Καθολικών της Αυλώνας [and even group of Catholics in Vlora]"; p. 54. "Η μουσουλμανική κοινότητα της Ηπείρου, με εξαίρεση τους μικρούς αστικούς πληθυσμούς των νότιων ελληνόφωνων περιοχών, τους οποίους προαναφέραμε, και τις δύο με τρεις χιλιάδες διεσπαρμένους «Τουρκόγυφτους», απαρτιζόταν ολοκληρωτικά από αλβανόφωνους, και στα τέλη της Τουρκοκρατίας κάλυπτε τα ¾ περίπου του πληθυσμού των αλβανόφωνων περιοχών και περισσότερο από το 40% του συνόλου. [The Muslim community in Epirus, with the exception of small urban populations of the southern Greek-speaking areas, which we mentioned, and 2-3000 dispersed "Muslim Romani", consisted entirely of Albanian speakers, and in the late Ottoman period covered approximately ¾ of population ethnic Albanian speaking areas and more than 40% of the total area. "; pp. 370, 374. ^ Stein, Jonathan P.; EastWest Institute (New York, N.Y.) (2000). The Politics of National Minority Participation in Post-communist Europe: State-building, Democracy, and Ethnic Mobilization. M.E. Sharpe. p. 172. ISBN 978-0-7656-0528-3. ^ Braude, Benjamin; Lewis, Bernard (1982). Christians and Jews in the Ottoman Empire: The central lands. v. 2. The Arabic-speaking lands. Holmes & Meier Publishers. p. 246. ISBN 978-0-8419-0519-1. ^ "INTAT GIS". Archived from the original on 2014-05-16. ^ "Albania is creating three free economic zones". emerging-europe.com. 24 August 2015. ^ "Subnational Economy Rankings - South East Europe - Subnational Doing Business - World Bank Group". www.doingbusiness.org. Retrieved 15 March 2018. ^ "International Development Funding Search Devex". www.devex.com. Retrieved 15 March 2018. ^ Vlorë, Bashkia. "Kreu - Bashkia Vlorë". Bashkia Vlorë. Retrieved 15 March 2018. ^ "Official Website of Academicus International Scientific Journal". ^ "Private Higher Education Institutions in Albania". ^ Ubisoft (2008). "Locations". Ubisoft. Retrieved 1 April 2011. Chisholm, Hugh, ed. (1911). "Avlona" . Encyclopædia Britannica (11th ed.). Cambridge University Press. pp. 65–66. This article incorporates text from a publication now in the public domain: Vailhé, Siméon (1912). "Valona" . In Herbermann, Charles (ed.). Catholic Encyclopedia. 15. New York: Robert Appleton. "Vlorë". The Columbia Encyclopedia. 2004. "Vlorë or Vlora, Ital. Valona, ancient Aulon". Crystal Reference Encyclopedia. 2001. Nagle, Robert (2002). "East European Experiments—Tourism/Tourist Information about Vlore (Vlore) Albania". Imaginary Planet Home. Retrieved 24 April 2016. Wikimedia Commons has media related to Vlora. Wikivoyage has a travel guide for Vlora.